Enjoy stunning full HD images and 24/7 reliability with the Economy line of displays. With a wide array of connectivity options, the EL series offers the unique combination of high performance and exceptional value. With several models also offering an OPS Slot, the EL series gives you all the flexibility you need to create a best in class signage solution. Available sizes: 32”, 42”, 46”, 55” and 65”. Superb performance, high brightness and a host of connectivity options make the V Series the ideal choice for all professional signage applications. With 700 nit brightness across the series, these models can be installed in all areas where there is high ambient brightness, while still delivering the crisp and clear picture you demand. Each model comes standard with an OPS slot, the V series offers you the ultimate integrated signage solutions. Available sizes: 42”, 46” and 55”. Ideal for projects where cost is decisive, the Q series is a range of cost-aggressive slim LED backlit displays which will fit snugly into almost any location. Available sizes: 32”, 42”, 46” and 55”. 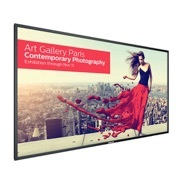 Create the most visually stunning video walls with our zero bezel range of displays. Available in 46”, 47” and 55” sizes, these displays create a memorable visual experience for you to get your marketing messages across in style. Both the 46” and 55” also has a high brightness models which allow brilliant picture quality even placing the displays facing the window displays with direct sunlight. Available sizes in 46”, 47” and 55”. Engage in a new era of interactivity with our comprehensive range of multi-touch displays. Perfect for all applications where multi touch is needed, these displays bring you closer to your target audience. Available sizes: 42”, 55” and 65”. Experience your content like never before thanks to 4 times the resolution of a conventional display. This ultra large sized displays 98” and 84” offers 3840 x 2160 pixels so refined, so lifelike, additional features like SmartControl allow you to manage and control your network remotely and FailOver mode. it’s a window to a new world.